A couple of fleet list updates to report today. The first is the return of First Eastern Counties ADL Enviro400 33821 YX63LKL to the eastern section of the X1 route between Lowestoft and Norwich via Great Yarmouth. 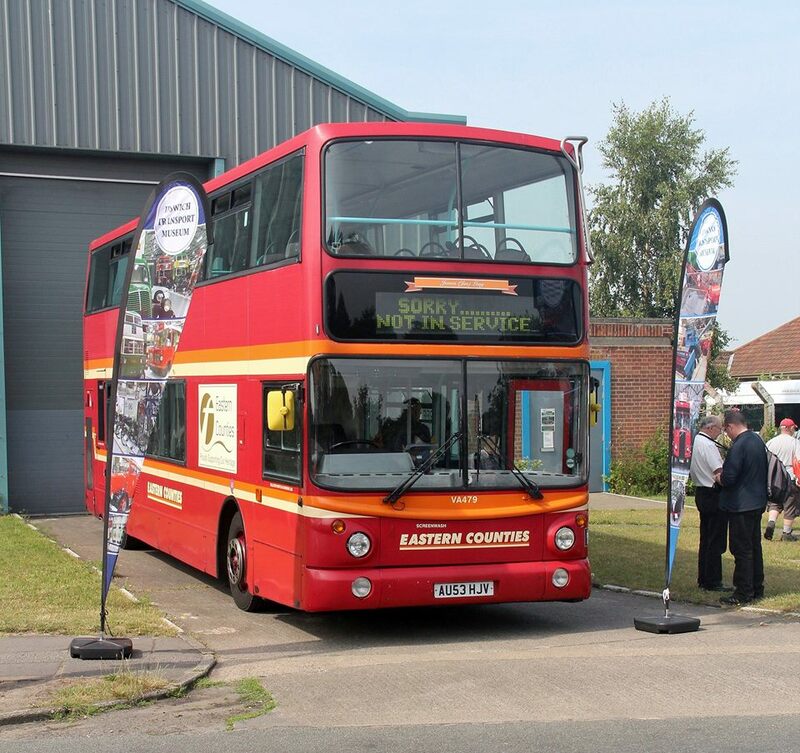 It was previously on loan to First Kings Lynn for use on the western part of the route. 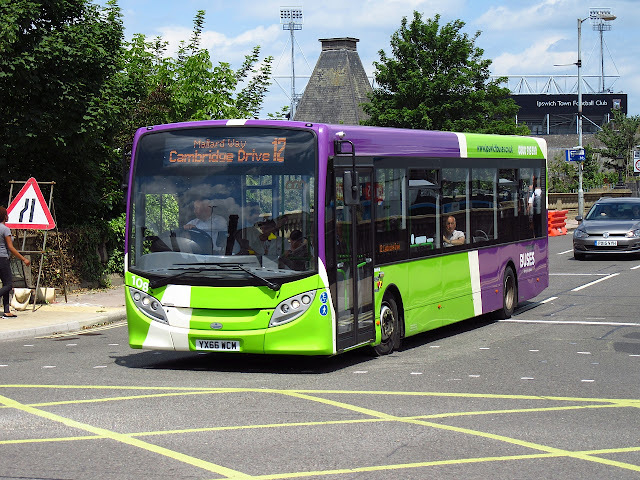 The second change to report is the return, off loan, of Konectbus Optare Solo 901 VX51RJZ. It was previously in use with Anglianbus. Just a reminder that we do update the fleet lists on the blog at regular intervals with last taking place only on Wednesday last. 559BPW was new to 'Counties' in January 1963 as their LFL59 and is pictured at Castle Meadow, Norwich in the late 1970's/ early 1980s. It lasted in service until 1981 when it was disposed of to Bygone Bristol Club of Elmers End. However, it has been recorded by Rob Sly as later being driven through Africa by five Danes writing articles and making television programs for the youth market on African life. It was observed in Cape Town during January 1993 with a later sighting reported in Zimbabwe in April of that year. This week's Notices and Proceedings Report, published by the East of England Commissioner, includes alterations to a number of services operated by Great Yarmouth based Ambassador Travel. 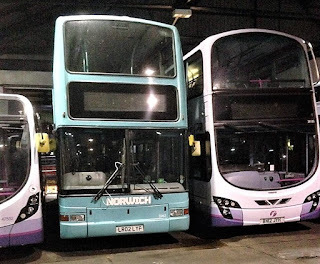 Former Great Yarmouth StreetLite 47506 SN64CRF returned to Norwich during Sunday evening and it is understood that similar 47508 SN64CRK is also expected to make the same journey today. With the car in for its MOT today (why do they still call it MOT?) I had some time to kill in Great Yarmouth this morning. Lurking around Market Gates I glimpsed, in the distance, a red double decker heading eastwards along St Nicholas Road. So I thought I would try and track it down and walked to North Drive in the hope of seeing it. Turning the corner and looking towards Britannia Pier, I did find a decker but not the one I was expecting. That was Youngs of Cambridge Vanhool Astrobel bodied Volvo B12B bearing the registration K99YCC. It was previously WA08APF with Berrys Coaches of Taunton. Anglianbus has announced a change to its 61 route in Great Yarmouth from 9th July 2017. From that date the 61 will no longer serve the Harfrey's Estate, less than three months after its introduction. Scania OmniCity YN05HFH on the 61 this morning, lettered up for the Bungay to Norwich service! The change will improve service punctuality although I understand the bus will still call at the Tesco Store in Cobholm. Arrivals at Market Gates should be slightly earlier with the return journeys continuing to depart at the same time. At least Anglianbus were prepared to give it a go! 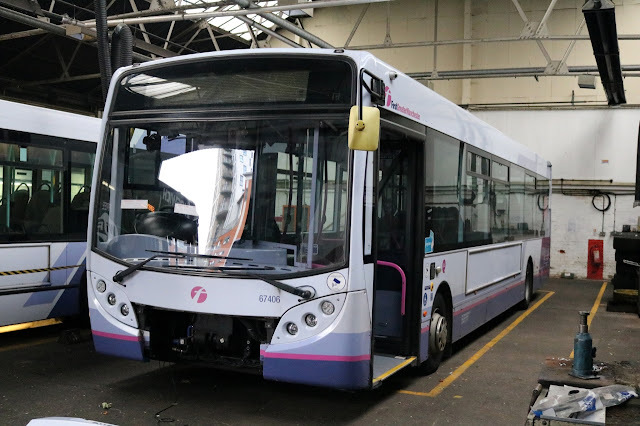 First Ipswich have taken over the operations of Park & Ride services in the town from July and the fleet of eight Alexander Dennis Enviro 300 cascaded from First Borders is undergoing repaint at Simon Morris ready for operations to begin in July. David Warren has been keeping us up to date with things and the latest photos suggest the transformations are all nearly complete. A Ninth Enviro has also arrived in the shape of 67406 SN13CKC which has come from First Manchester, this will act as a spare vehicle and will be painted with a Blue front and remain in First livery. It was swapped with Volvo B7RLE 66983 KX05MHM at Bolton depot. No doubt a trip to Ipswich in July to see them in action is on the cards now! Many Thanks as always to David for the photographs. The first of the nine coaches sighted at Beach Coach Station early this afternoon was Three Star Coaches Sunsundegui Sideral bodied Volvo B9R BX62BBV, new to the operator in November 2012. Next to that was a double deck Ayats Bravo from the L70HEY from the Heyfordian fleet. The operator has two which have both recently been re registered. However, Grahame has done some detective work and has identified it as previously being OU07JWD - elementary my dear Watson! Another interesting visitor was West Row Coach Services' W914BEC. The Irizar bodied Scania was new to Harrison of Morecambe in March 2000; although West Row acquired it from Kirkham/Rigbys of Altham in February 2007. An operator which regularly frequents the town is Johnson's Coach Travel with its distinctive livery and today its YX16YNA paid a visit. An update on the latest loan situation at Caister Road is in order following subsequent vehicle movements. LIL9717, previously registered as BV51KNY, was acquired by Payne of Offord Cluny during April this year. Belle, in turn, purchased it from Greeves of Netherton, West Midlands in January 2005. Fortunately Will Drake was on hand to get a photo of it inside the depot - Many thanks Will! Update: Apparently it's on loan to Great Yarmouth for a couple of days! 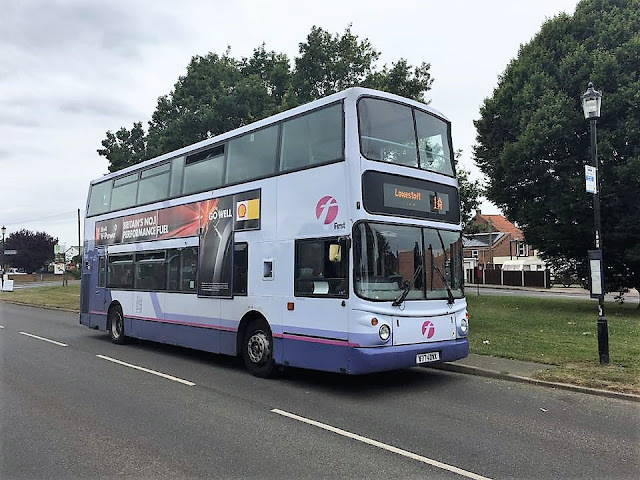 First Great Yarmouth continues to experience vehicle shortages at its Caister Road depot following the transfer of the Enviro300s to Ipswich for Park and Ride duties. This explains the appearance of Norwich Yellow Line Plaxton President bodied Volvo B7TL 32106 LT02ZCV on the service 8 between Gorleston's James Paget Hospital and Second Avenue in Caister for most of today. The shortage has been compounded by the fact that deckers 32062 W422SRP and 37274 LK58EDF are both out of use requiring a new engine plus Dart 42929 SN05EAJ is off the road for inspection repairs. My thanks to Will Drake for the photo and to First Great Yarmouth for the update. 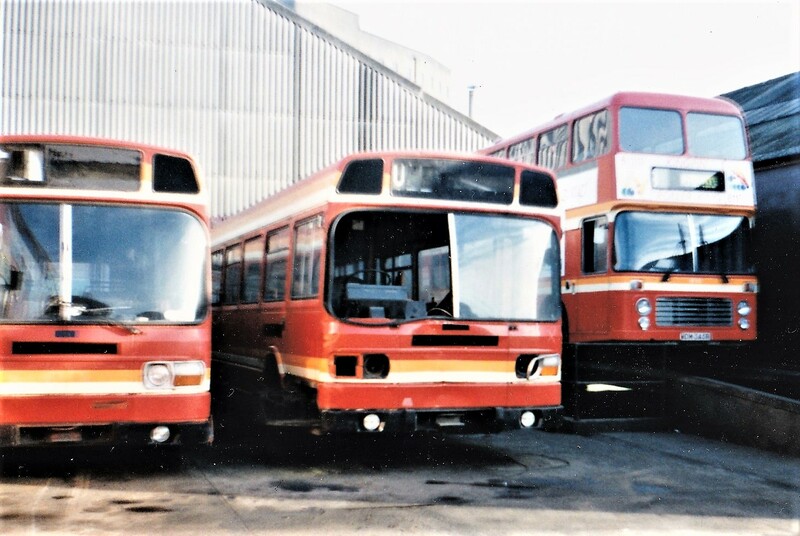 This week's Throw Back Thursday continues with a look at Ipswich's Eastern Counties depot on 4th March 1995 - my apologies for the photo quality. This time we take a look inside and find a couple of Eastern Counties vehicles in the rear of the depot in the form of a Carlisle bodied Iveco minibus and a Leyland National. The former, F710NJF was new to Leicester Citybus in August 1988 and joined the Eastern Counties fleet the following year. It was withdrawn in 1996 with its final resting being at Ben Jordans in Coltishall. 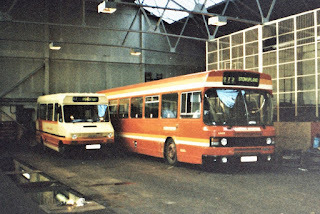 The Leyland National was PEX613W which was delivered new to Eastern Counties in October 1980 and remained in service until 1997. Its last journey was to Spall of Dallinghoo for scrap. A couple of interesting local entries appear in this morning's Notices and Proceedings Report published by the East of England Traffic Commissioner. Both relate to Go West Travel, operating as Stagecoach East, which is to amend the timetables of its X8B/X29 route between Kings Lynn and Fakenham plus its X29 Norwich to Fakenham service from 23rd July 2017. The full Notices and Proceedings Report can be viewed HERE. Today saw a fitting Tribute take place to Jim Long, a good friend and regular contributor to the blog who passed away suddenly a year ago. Jim was a loyal Eastern Counties Enthusiast and was always around the town of Ipswich armed with his camera to record the latest happenings, we built up a great friendship and shared many photographs and met regularly for a drink and a catch up. 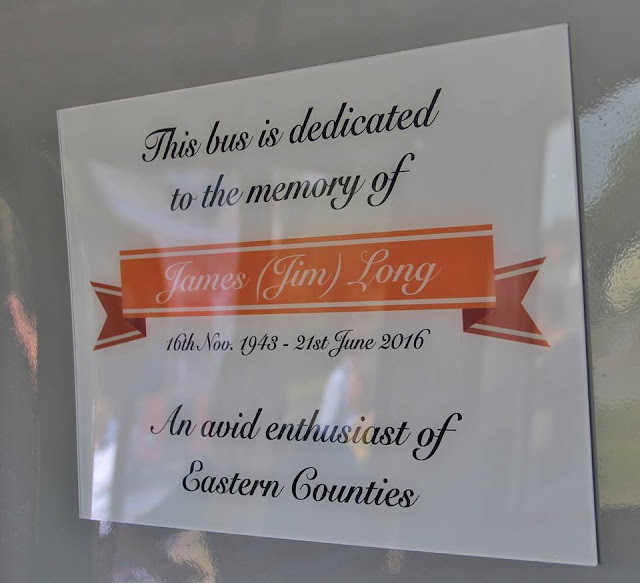 Jim's wife Eve and his family decided to donate his photo collection to the Ipswich Transport Museum and today saw a fitting gesture from Eastern Counties, Heritage liveried 32479 (AU53HJV) was today named after Jim at the museum and he will be fondly remembered around the town. 32479 or James Long as its now known. A fitting tribute to a true gent. I only wish i was notified about this taking place today as both Roy and myself would have liked to have attended, very disappointed that we were not made aware of the event, still thinking of you Jim! Special Thanks go to Stuart Ray for the photographs from this morning. Saturday i was introduced to the Greater Anglia Day Ranger Plus ticket, Whats that i hear you cry!. Well its a bargain at £18.50 giving you a day of travel across the Greater Anglia Network and the chance to visit many places in our region. The day was organised by regular blog contributor Tim Miller as he is au fait with the Train schedules!. We met nice and early at Acle Station (Free Parking!) to get our first train into Norwich to then get my first ride aboard the Class 37 Short Set service to Yarmouth and back. Once back in Norwich our next port of call was going to be Ipswich, we boarded the London Liverpool Street service and headed for Suffolk. On arrival we spent an hour or so at the station area, cameras put to good use as well as sampling the local brew (It was 25 degrees!). Next stop on the trip was Cambridge, we boarded the GA refurbished Class 170 and headed to the University city. The Station area at Cambridge has changed somewhat since my last visit and redevelopment of the whole area has seen a larger area for buses and taxis with many new student dwellings being built in the area also. 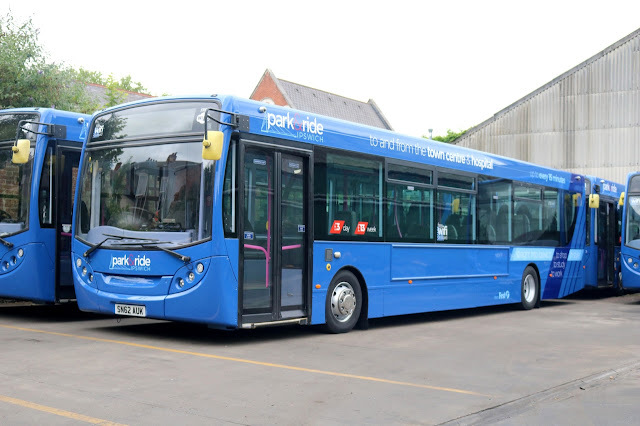 Stagecoach is the main operator in the city and has recently introduced a new fleet of Alexander Dennis Enviro MMC's for the Park & Ride services. 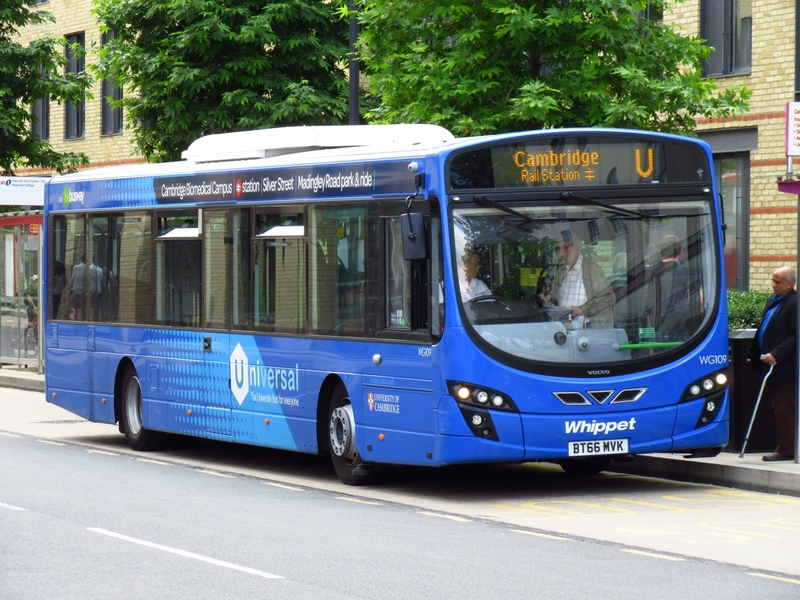 Former independent operator Whippet also run into the city and have recently introduced new Volvo B7RLE's to the fleet in association with Cambridge University to link Campus to the city. The company was taken over by Tower Transit in 2014. The final leg of our journey was a quick stop at Ely before returning to Acle via Norwich. A good day out and well worth the ticket price to get around East Anglia, luckily only a ten minute hold up at Ely on the way home but all in all the trains worked fine and certainly worth doing again. Many Thanks to Tim for his organisation skills with the timetables aswell! 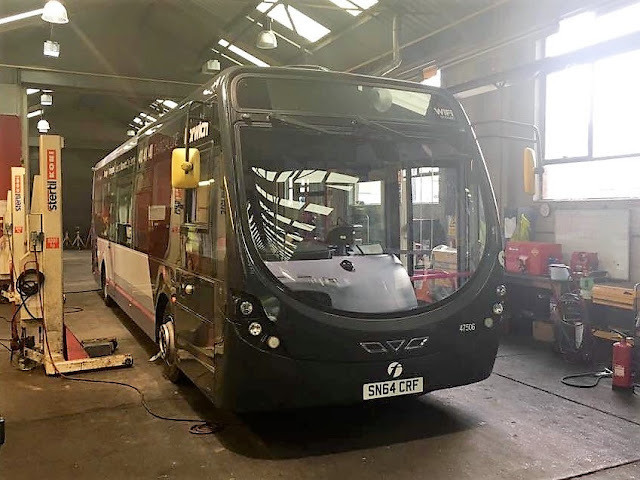 Christian Newsome has made me aware that A1 Minibus & Coach Services of Methil in Scotland has advertised a former Anglian Scania OmniCity as being available for sale on eBay. Further information can be found on eBay HERE and my thanks to Christian for the heads up. This lunchtime I met up with fellow blogger SteveW and we decided to adjourn to the nearest hostelry to partake of light refreshments. Whilst awaiting our fayre we noted a First pink streetdeck thingy passing through Market Gates on the 8 to Caister. We were hopeful of getting a photo of it on its return journey to the James Paget Hospital at Gorleston. Also noted was the Lowestoft heritage bus ALX400 30888 W743DWX shuttling around on the 1B route between Vauxhall Holiday Park and Hemsby via Market Gates. I also wanted a photo of that too which I was successful in getting after saying my farewells to Steve. 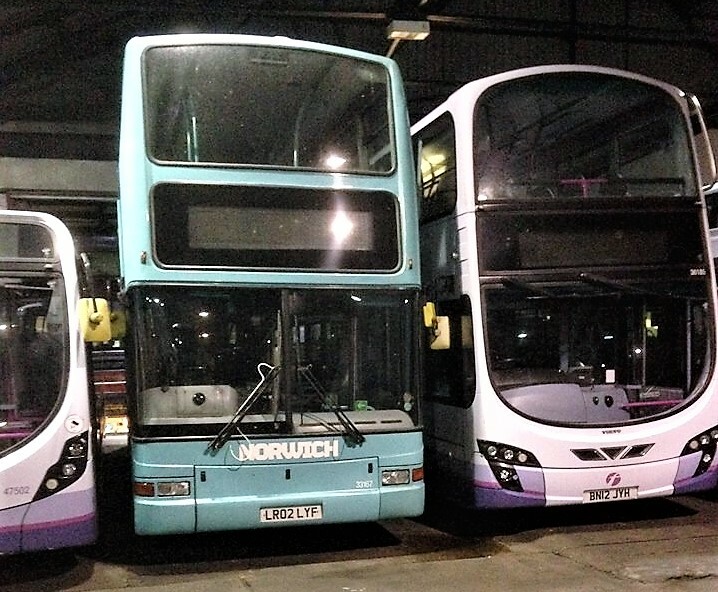 Why the unusual workings with vehicles from Norwich and Lowestoft depots respectively? 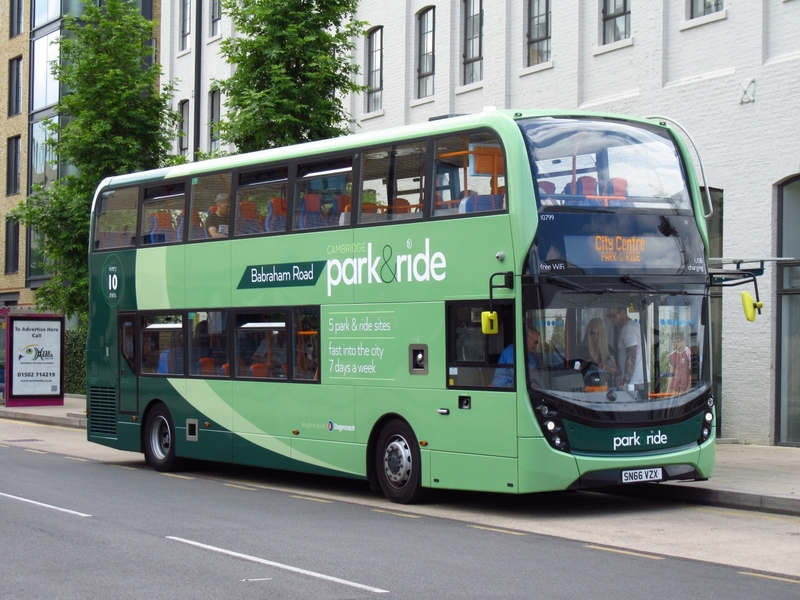 I can only assume that Caister Road had sent the Enviro300s onto Ipswich for their preparation for park and ride services; leaving Great Yarmouth short. I am guessing that the streetdeck was in town for its annual inspection checks and that it was commandeered for service. 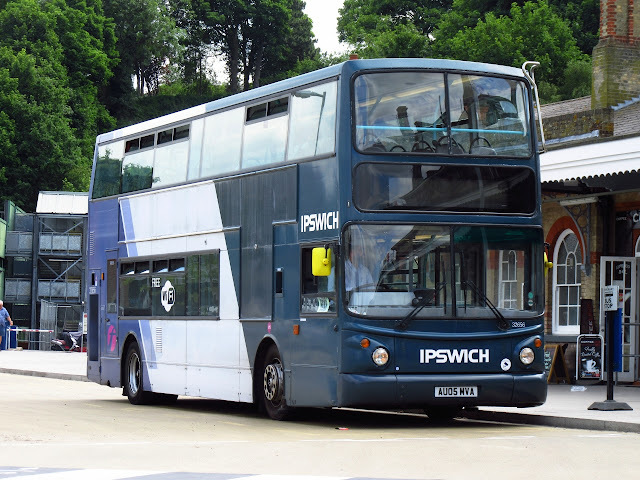 On a personal note, I would like to wish Ipswich Bus Blog owner Clive Nixon a speedy recovery following his recent setbacks. I hope it won't be too long before he's back reporting on the Ipswich bus scene. 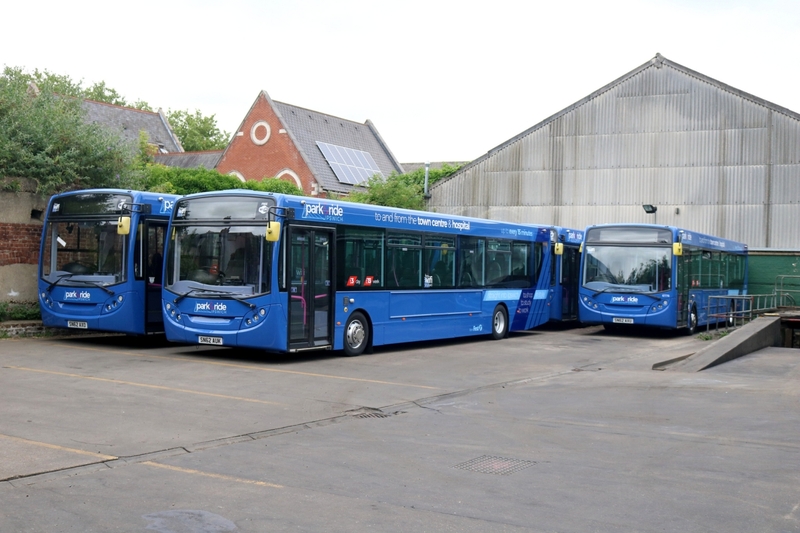 After almost a couple of months without any update, Anglianbus has finally published its latest fleet listing. Naturally the High Street was the main focus with all busses bound for the town calling there. 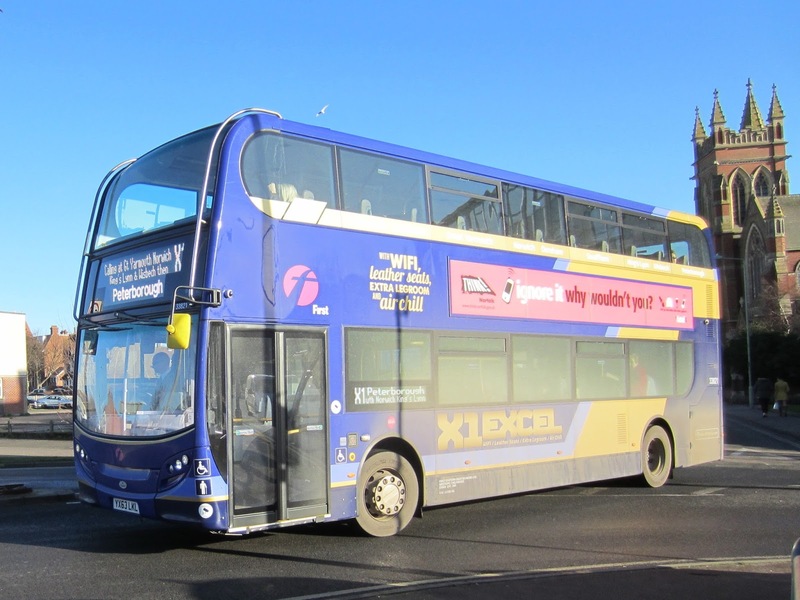 One time a stronghold for First Eastern Counties, the major player now is Go-Ahead subsidiary Konectbus; although the former still operates through on the X1 Norwich - Kings Lynn - Peterborough route. Although I didn't know it at the time, I was fortunate in photographing one of the three times daily (four times on schooldays) service 20s to Scarning via Brooks Drive in Dereham. Former Anglian Optare Tempo YJ55BLX was operating the 12:05 departure. The hourly service 4, between Swanton Morley and Norwich, was observed with ADL Enviro400 SN61CZV in charge. It is seen here passing Dereham Market Place following the 13:00 departure. The half hourly 'Straight 8s' between Toftwood and Norwich (via Dereham) were in the hands of the specially branded ADL Enviro400s delivered in 2015. The photo shows SK15HKE picking up passengers at the Market Place stop on the 12:38 Toftwood to Norwich Riverside. An interesting 'off route' working was that of Series 5 branded Optare Tempo YJ09MHY on the hourly Dereham to Swaffham 11 route. It seemed a little incongruous in seeing that it would run to and from Norwich rail station! The final photo is of First Eastern Counties X1 branded ADL Enviro400 33816 YX83LKE about to leave on a mid afternoon service to Kings Lynn. 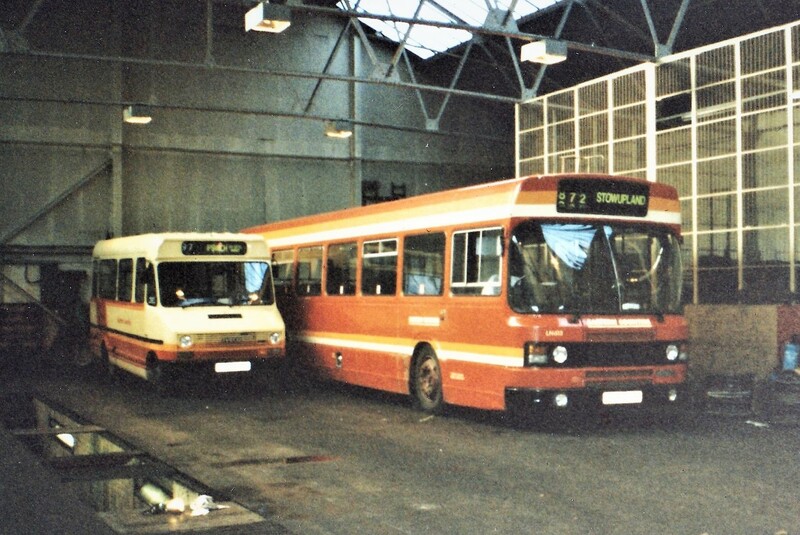 The photo shows the Foundation Street yard complete with two Leyland Nationals and a Bristol VR. The two 'Nationals' were LN567 and LN599 new in September 1976 and January 1978 as PVF367R and WVF599S respectively. Whilst they both look in a run down state they were being prepared for Greenway conversion which took place in 1995. As for WDM345R, it had a nomadic existence but was new to Crosville Motor Services as their DVL345 in May 1977. It moved on to Potteries Motor Traction in February 1990 where it stayed until December 1992. It then transferred to Eastern Counties later that month becoming VR183. It was finally withdrawn in November 1997 and moved to Ben Jordan during March of the following year. It had been broken up by early 2002. 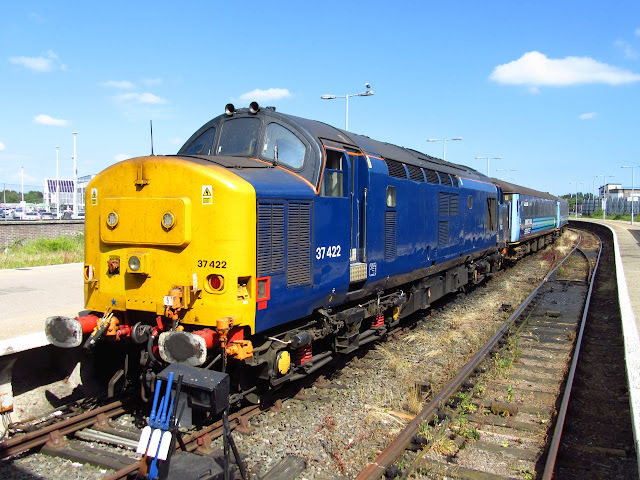 My thanks to Rob Sly for his illustrated history of WDM345R. A few interesting local entries appear in this morning's Notices and Proceedings Report published by the East of England Traffic Commissioner. Acle based Our Hire, trading as Our Bus has registered three services all commencing from 25th July 2017. 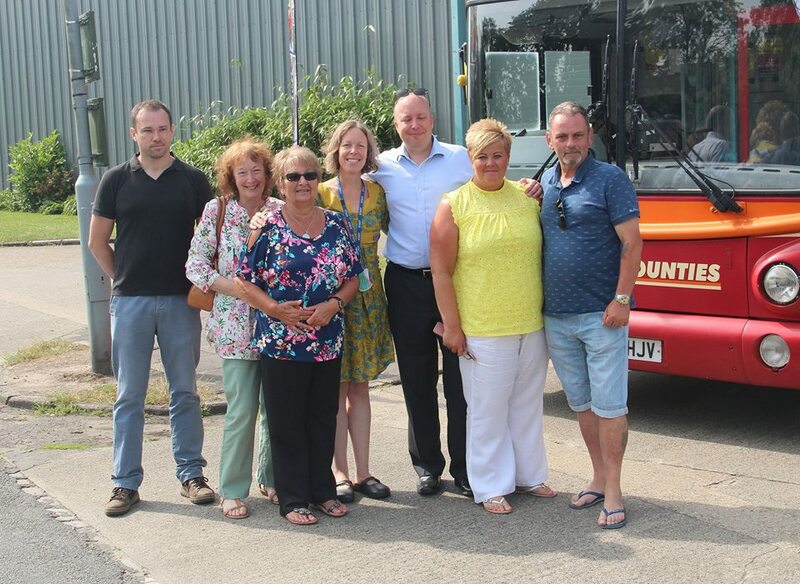 They are the 100 from Newport, Hemsby to Market Gates; the 200 serving Vauxhall Holiday Park and the 300 Seafront service from Seashore Holiday Park. They all operate Monday to Friday except the 200 which runs on Saturday as well. Our Hire is also to vary the timetable and route of its current Bradwell to Hemsby service from the same date. Go West Travel, operating as Stagecoach East, is amend the timetable of its 29 route between Fakenham and Wells Next The Sea from 23rd July 2017. Among the seven coaches parked up at Great Yarmouth's Beach Coach Station this afternoon was an Alfa Travel 2017 registered Mercedes Benz Tourismo. Other regular tourers represented were Shearings Holidays' with Setra BT63GCK and Gee-Vee Travel's with their VDL Bova Futura GT09GVT (formerly WA09 AZL). 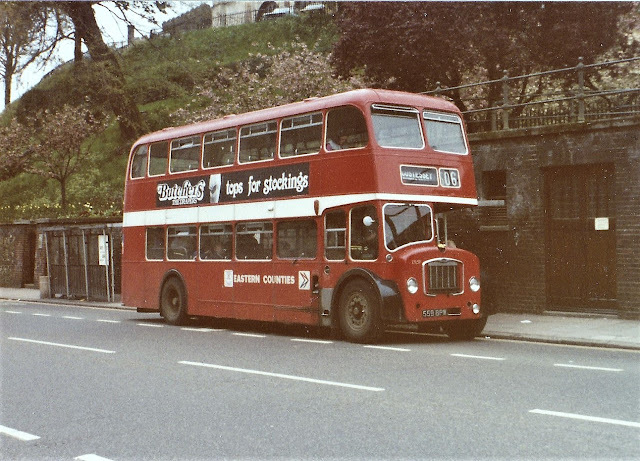 During January 1987 one of Lowestoft's major employers Eastern Coach Works (ECW) closed for the last time. ECW was probably best known for its close association with Bristol Commercial Vehicles. It is expected that a large number of Bristol/ECW types will be on display at the 30 year commemoration of closure being held at the East Anglia Transport Museum on the 8th and 9th of July. As referred to in the previous post, I had some trouble in trying to photograph a Stagecoach South Downs Connection branded bus on its rightful route 1 during Tuesday afternoon. 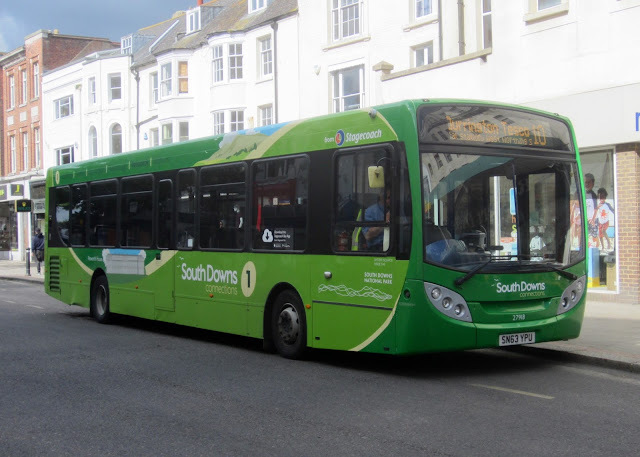 The second bus seen in that livery was Enviro300 27918 SN63YPU which was observed on trips to and from Durrington's Tesco store on the 5 and 10 routes. Another unexpected substitution that day was a double decker on the same routes which are usually worked by saloons. 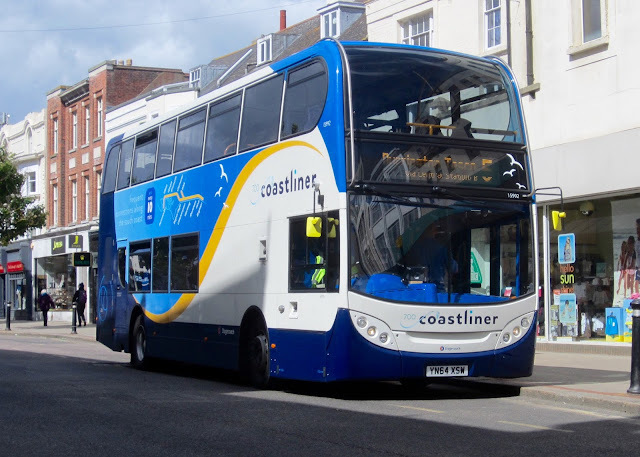 Not only that, it was Coastliner 700 branded Enviro400 15992 YN64XSW! It's always interesting to get a photo of busses that are not on their intended routes.